I don’t often dress up for Halloween. I like dressing up, it’s just that it’s become this hyper-competitive, overly complex ordeal these days. And who has time for that, really? Of course, the fact that I don’t’s probably implied by my saying “dressing up” rather than “cosplay” — seriously, even the vocabulary is unnecessarily involved. Also, get off my lawn. But I am, as the title suggests, dressing up as Agent Peggy Carter from Marvel’s Agent Carter, and also from the gloriously corny first Captain America … and anywhere else they feel marginally justified in putting a cameo, because she may be the most lovable, not to mention moving, vivid, and beautiful, character [besides Loki] they’ve recreated lately — but — AGENT CARTER ZOMG!!! My husband’s Grandpa wore hats — lots of hats — hats all the time. My kind of human. When he passed away, my mother-in-law asked if I would like one of them, a beautiful red wool fedora with a white rope band. It’s a fabulous hat which I treasure. 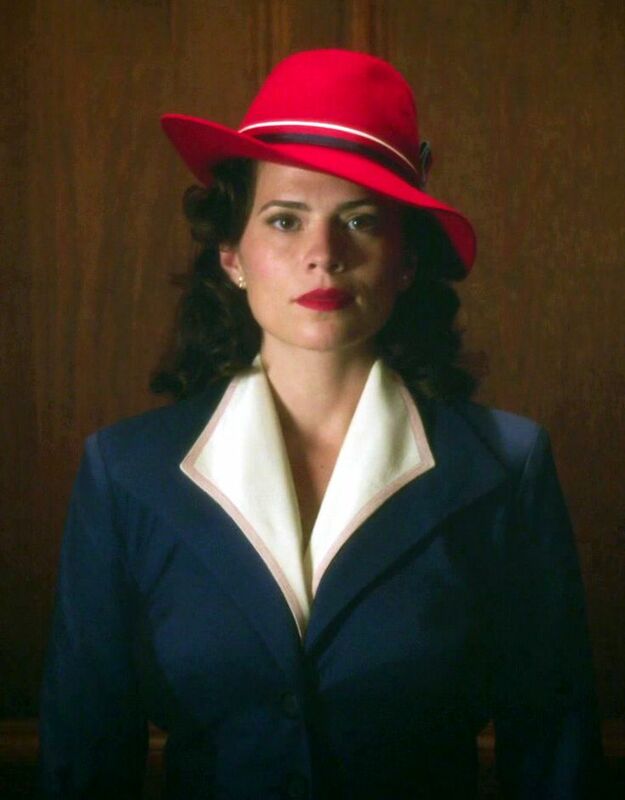 So, naturally, when I watched the premier of Agent Carter, it came immediately to mind. (Yes, you can buy the actual hat Hayley Atwell wears, but what’s the fun in that? Also, $83 would blow the entire costume budget.) And … in watching the rest of the show, I fell in love with the wardrobe, and decided to dress up this Halloween. Halloween, which is today. Eesh. Watch out — I’m comin’ for your patriarchies. 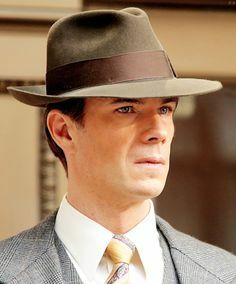 My husband has graciously agreed to be Jarvis, which I’m sure I don’t need to tell you makes my little heart go pitter pat. Three-piece suits … Le sigh. Also, the bookcases and wall moulding. So much pretty. 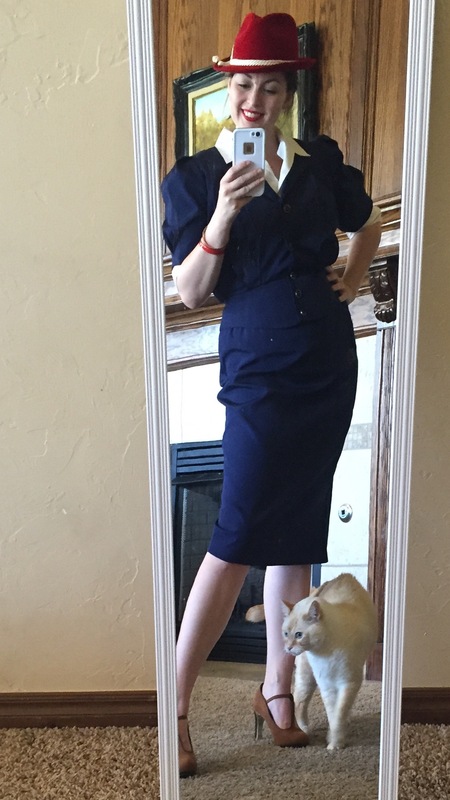 I’ve studied more pin curl and vintage makeup tutorials, scoured more thrift stores, and done more thinking about pocket squares and collar shapes than I have since I organized my wedding, from New Zealand, in the dark days (as I believe I’ve already mentioned) before Pinterest. (Long, but not very interesting, story.) I also feel vindicated, by now, in my impression that cosplay is far too involved of a thing. On the other hand, fun! Pretties! Lipstick! Hats! So it evens out. For Jarvis’s costume, I took the second picture as my guide and I decided to use the gray tweed suit my husband already has, despite its tragically modern lapels and un-pleated, un-high-waisted trousers. I’d just find a similar tweed, or possibly plaid, vest to pair with it, and a yellowish, vintage-ish tie. And a white dress shirt. Who doesn’t have a white dress shirt?! Well, we don’t. Or rather, we didn’t — now he has one, and I have … well. I’ll get to that. I also tried to find a brown fedora. Something with nice structure and a wide-enough brim, that wasn’t too expensive, and that I could buy in person to make sure it fit. I gave up on the grosgrain band and non-stitched brim after a while (that’s a seriously expensive hat there, folks). And all the brown ones were either too clumsy-looking or just too Indiana Jones. I eventually found a reasonable grey approximation instead at (of all places) Pacsun, which I haven’t been into since my angsty teenage days. It’s posher now, but still caters loyally to the angsty teen. The vest was a similar story — I gave up, at length, on vintage — then on tweed — then almost altogether after about the eighth or tenth store. Oh, there certainly are vests available, but … for that much, I think I’d rather get something he would actually wear more than once. Just before I gave up for good (as it usually happens) I found it — at Target, grocery shopping with my daughter and trying to convince her that she really has quite enough Froot Loops for the foreseeable future. A perfect, subtle gray plaid mens’ vest. For (a still-extortionate, but more justifiable) half the price of the others I’d seen during the previous days’ frustrating quest. I got the wrong size, though, then exchanged it for another wrong size because the hanger was a lying liar who lies. So at last I just dragged my longsuffering husband to the store in person to try it on already, and got the size I’d tried to buy the second go around — but for real this time. 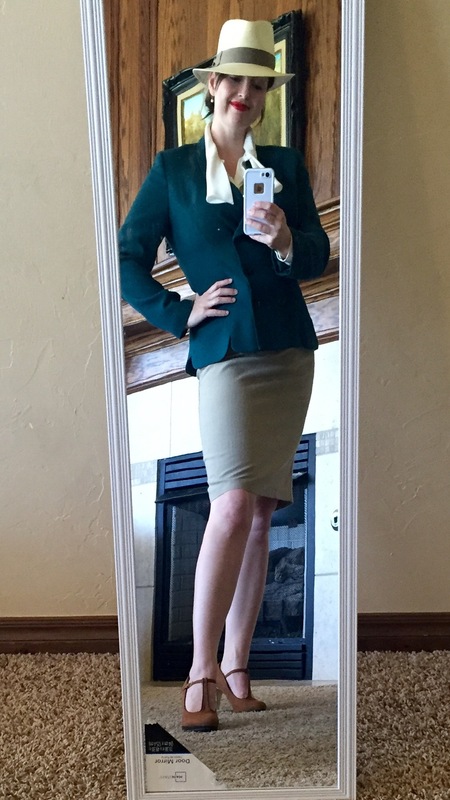 I also got a green shawl-collar jacket because it looked like something she’d wear, and because it fit beautifully. The bright jacket and dark skirt, with the silk notch-collar blouse. 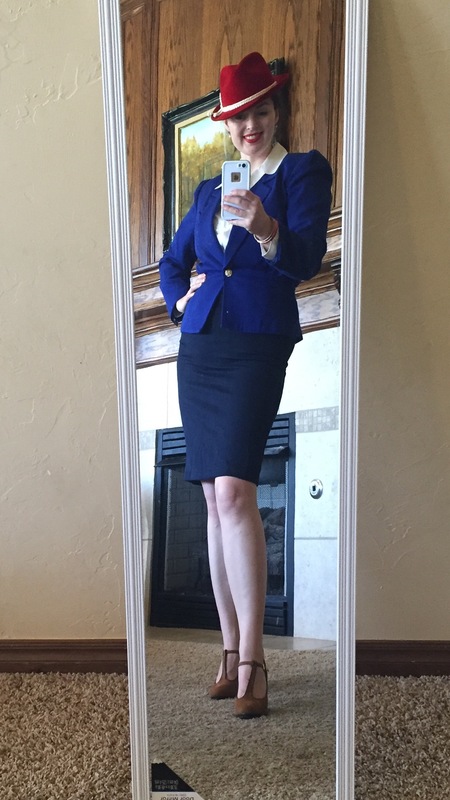 I wish this jacket had had a matching skirt, because it really is such a lovely color. The most abstract costume — more “inspired by Carter” than imitating her. Dark green is just so lovely, and I loved the notched hem on this jacket. The red hat — while fabulous — isn’t quite as wide-brimmed as the one Carter wears, so I thought I’d see how my Panama hat looked with it. While I like the shape, it’s really too late in the year for a straw hat, for me. Vaguely reminiscent of an outfit she wore in Captain America; the belt is too wide and detailed, I know, but this skirt has a quite hideous elastic waist I wanted to make sure was covered. Ding-ding-ding! We have a winner. (And a Loki. Every winner needs a Loki.) See the baggy wrinkles on the skirt? I sewed up the sides a bit and it’s much better now. No, I’m not going to wear the bangles. Yes, I’ll be wearing my hair down and curled. And then there’s the makeup. 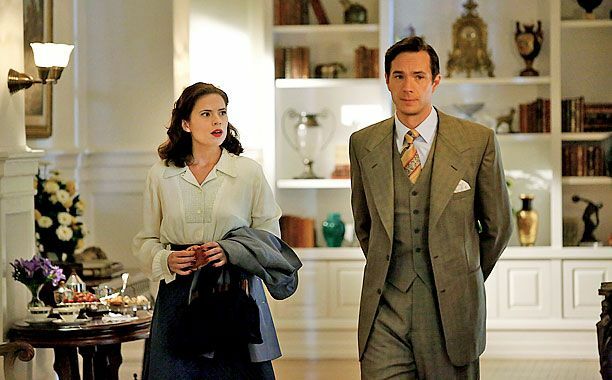 Do you know how many Agent Carter makeup tutorials there are out there? A gazillion. They’re all fabulous. Ditto pin-curls. I have nothing to add to them; just second the recommendation to get the duckbill clips. They’re great. And you can use them like robot puppets when you take them out to make your daughter laugh. Below was my first trial run for the pin curls. They turned out okay, actually, but as you can see, after several games of chase and maybe a nap, they were a bit worse for wear. It was also my trial run for the makeup. I used NYX’s Matte Lipstick in Alabama (allegedly a good copycat for the Besame Red Velvet that Atwell wears) — I’m a fan. A bit darker than I normally wear, but I like the matte finish and I really like that it didn’t rub off on my teeth. It’s darker in person than in the picture. ELF eye makeup, because that’s what I had, a sort of toned-down smokey eye with grey-brown nudes and a dark seal brown brow. I’ve been doing my eyeliner as a narrow penciled line, then with a bit of darker brown (or black, in this case) shadow over it to soften it, which I think works well enough here and saves me trying to poke my eyes out with that whole inside-the-lashes trick. Anyway, I hope to con someone into taking some pictures of us this evening, and if they turn out well, I’ll show you how it turned out. Have a happy and safe Halloween, everyone!